These are a few of my favorite books on web design. I’m a huge fan of Dan Cederholm‘s writing and approach to crafting CSS and HTML; he’s not a half bad ukulele player either. I couldn’t find my copy of “Designing with Web Standards” Book by Jeffrey Zeldman, but at this point in the web design world, that book would probably be thicker than the phone book of a very large city. P.U. 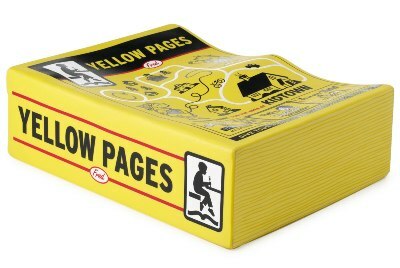 The stinky, antiquated Yellow Pages. Remember those? I always thought they of sort smelled weird. Was it the ink? Was it the paper? Was it the fact that they just threw it on the front doorstep outside my house in a bag? Sorry I digressed …that’s probably why Jeffery switched over to this new format of the “A BOOK APART LIBRARY“; otherwise today’s edition of “Designing with Web Standards” would be, no joke, probably eleven inches thick. As you might have seen from the featured photo, I nabbed the first two of probably many more ABA books so I can continue getting up to speed and staying on top of all things web design. A little backtracking here but…Speaking of the smell of books, the good smelling book smell I mean, although I have the digital versions of “HTML5 for Web Designers” and “CSS3 for Web Designers” I also grabbed the hardcopies of them because – this is weird but I’m going to admit it – if you haven’t figured it out already, I love the smell of new books. The smell of old books isn’t bad either, but there’s something about new paper and fresh ink in a new book smell I can’t resist. Someone needs to make a candle or a perfume scent of that. Maybe they have, I’m too focused to ask Siri to google that right now. Anyway, although I’m all about minimizing stuff in our lives and I am finally starting to read more and more on my iPad Pro and Kindle, for some books it’s hard to compete with being able to quickly flip through a book and find what you are looking for – am I right? Plus, iPads and Kindles: they don’t have that book smell do they? They probably have scented cases. I need one. I wonder if people said this sort of thing about records, tapes or CDs? Probably not. Bookshops smell so good but last time I stepped into a music or a video store and took a deep breath, well, it wasn’t pretty. Blech!